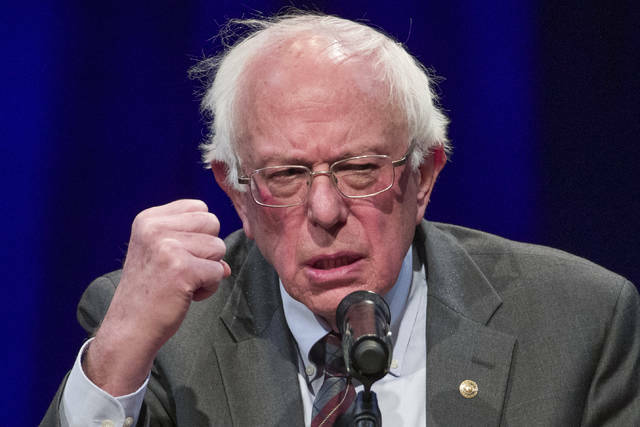 NEW YORK (AP) — Vermont Sen. Bernie Sanders and his chief lieutenants are offering contrition as some of his 2016 campaign staffers face allegations of sexual harassment that threaten to derail a second White House bid before it begins. The timing could not be worse for Sanders, who is gearing up for a second presidential bid. His senior adviser told the AP last month that Sanders would run a “much bigger” operation and would start out as a front-runner if he ultimately decided to run. Should he run again, the 77-year-old would enter a crowded field that features multiple prominent liberal women. Massachusetts Sen. Elizabeth Warren has already launched a presidential exploratory committee. Sen. Kirsten Gillibrand of New York, who has been a central figure in Washington’s reckoning with the #MeToo era, is considering a presidential run. Sen. Kamala Harris of California could also be a leading contender. RoseAnn DeMoro, the former executive director of the National Nurses United and a chief Sanders ally, suggested the revelations might help his political future by forcing an important conversation and stronger anti-harassment policies. Associated Press writers Meg Kinnard in Columbia, South Carolina, and Juana Summers in Washington contributed to this report. Disclosure statement: Kathryn L. Pearson does not work for, consult, own shares in or receive funding from any company or organization that would benefit from this article, and has disclosed no relevant affiliations beyond their academic appointment. Despite some brash and not insignificant opposition, California’s Nancy Pelosi is returning to her previous role as speaker of the House. She will preside over a chamber that is 77 percent male and a Democratic Caucus that is 62 percent male. When the Democratic Caucus held their leadership election on Nov. 28, Pelosi won the nomination on a 203 to 32 vote, falling 15 votes shy of the 218 she would later need to win the speakership with all members voting. When a vote was taken on the House floor on Jan. 3, she won by a vote of 220 to 192, with 15 Democrats voting for someone else or voting “present.” The close vote illustrated, once again, Pelosi’s skill in coalition-building and counting votes, but also that some Democrats – particularly new members and those in swing districts – are dissatisfied with her as the party’s standard bearer. As a political scientist who focuses on gender and party discipline in the House of Representatives, I have studied Pelosi’s leadership and how she was able to hold it for so long. It’s important to realize that Pelosi’s battle to win over wavering Democrats didn’t begin in November 2018. Rather, it stretches back to when she was first elected to leadership in 2001. Her ongoing ability to rally members of her own party illustrates why she has been among the most successful U.S. House speakers. It also suggests her leadership will help Democrats in Congress as they negotiate with President Trump and Senate Republicans, even if Pelosi remains unpopular in some Democratic members’ districts. Pelosi’s rise to power and leadership are characterized by her intense partisanship, fundraising prowess and coalition-building within her own party. Elected to the House in 1987, she won her first leadership race as party whip in October of 2001, defeating Steny Hoyer of Maryland by a vote of 118 to 95. As minority leader, Pelosi established a reputation as a pragmatist who enforced party discipline, counted votes, built coalitions – and raised enormous sums of money for her colleagues. Fast forward to the 2006 elections – halfway through the second term of Republican President George W. Bush. Democrats gained 30 seats and majority party control. Taking the gavel at the start of the 110th Congress, Pelosi became the first female speaker of the House, presiding over an 84 percent male chamber. Serving as speaker from 2007 to 2010, Pelosi benefited from – and expanded – the centralization of party leaders’ power that occurred during the previous 12 years of GOP control of the House. As she stepped into the leadership role in 2007, Pelosi had more tools and prerogatives than her immediate Democratic predecessors, Tip O’Neill, Jim Wright and Tom Foley. That’s because under Republican speakers Newt Gingrich and Dennis Hastert, the shift of power away from committee chairs to party leaders – a change that had been taking place since the Democratic reforms of the 1970s – picked up speed. For example, Republicans instituted six-year term limits on committee chairs in 1995 and made clear that seniority was only one of many factors that a party leadership-led steering committee considered when selecting committee chairs. During her first two terms as Speaker, Pelosi maximized her influence, setting the legislative agenda, pursuing partisan policy initiatives and fundraising for her colleagues. As I argue in my book on party discipline, Democratic committee chairs, grateful to return to the majority, were willing to cede power to her and other party leaders. For the most part, Pelosi worked hard to build consensus within her party and shut Republicans out of the process. She frequently met with freshmen and more moderate and conservative Democrats to find common ground on the party agenda. Under her leadership, House Democrats voted on average with the majority of their caucus 92 percent of the time in 2007 and 2008, setting a record for party cohesion. Pelosi routinely challenged President Bush and congressional Republicans, particularly on issues related to the war in Iraq. When Obama was first elected in 2008, the Democrats gained unified party control of the White House and both chambers of Congress. Pelosi had a new challenge: building coalitions to pass the president’s ambitious agenda items – like health care and financial regulatory reform – rather than the easier job of simply attacking a Republican president’s proposals. Pelosi’s role in the passage of the Affordable Care Act can hardly be overstated. She brought Democrats together to start the process in the House before Obama became deeply involved. Three House committees marked up the bill which Pelosi then assembled. When key House Democrats threatened to withdraw their support over disagreements related to abortion funding, Pelosi appeased them and attracted enough votes to pass the bill. And when it seemed that the House and Senate would not be able to reconcile their versions after Senate Democrats lost their 60-vote filibuster-proof majority with the special election of Republican Scott Brown of Massachusetts, who filled the seat of the late Democrat Ted Kennedy, Pelosi’s leadership was critical in crafting and executing a complicated legislative strategy that resulted in the bill that Obama ultimately signed into law. House Democrats were largely unified on other votes as well. The average member voted with the majority 91 percent of the time in 2009 and 89 percent in 2010. But Obama’s legislative successes came at a cost. During the 2010 midterm elections Democrats lost 64 seats. Republicans gained a 242 to 193 majority, their best showing since 1946. Back in the minority, Pelosi lost the speakership but was reelected as Democratic leader in 2011, defeating North Carolina centrist Heath Shuler by a caucus vote of 150-43. In a sign of dissatisfaction, 19 Democrats did not support her in the vote on the House floor. On Jan. 3, 2017, reeling from being completely shut out of power in Washington, all but four Democrats voted to reelect Pelosi as their leader for the eighth time. However, this show of Democratic unity on the House floor masked the uneasiness during the party’s internal contest between Pelosi and relatively unknown seven-term Democrat Tim Ryan of Ohio in late November. Pelosi prevailed, 134 to 63 – hardly a ringing endorsement. Not surprisingly, with deep policy divides and intense competition between the parties, along with the difficulty of negotiating with President Trump, finding that common ground has been elusive. Without the votes to advance the Democrats’ agenda in the House, criticizing Republican policies and especially President Trump was the best way for Pelosi to get attention. It also helped Democrats win elections in 2018, as a majority of voters saw the 2018 election as a referendum on the president. And so to Pelosi victorious. She brings three main strengths as the party’s leader: fundraising prowess, experience and skill in legislative bargaining and coalition building, and the ability to effectively challenge Trump with policy and procedural expertise. Pelosi showed her skill when confronting the president about the government shutdown during a highly publicized meeting on Dec. 11. Indeed, it was praise from Democrats for her strong performance that day that likely bolstered her bid for the speakership. Her skill has also been display as Pelosi has won over skeptical Democrats on both her ideological left and right since the November elections. Pelosi has relied on the immense power and prerogatives of leadership that she herself helped to expand, winning over members one committee assignment and policy promise at a time. However, as part of the bargain, Pelosi ultimately agreed to curb the power of the speaker and limit her remaining time in leadership to four years. She also agreed to a series of proposals by the “problem solvers” caucus that would allow somewhat more opportunities for junior members to be involved in policymaking and large bipartisan coalitions to move legislation that party leaders had not put on the agenda. Democrats’ internal leadership battle made clear that the party needs to develop a deeper bench of potential leaders with skills and experience to replace not only Pelosi but long-time #2 and #3 leaders Steny Hoyer and James Clyburn as well. However, it also shows that women leaders need to take extra steps to prove themselves in a male-dominated institution. After all, neither Hoyer nor Clyburn faced any opposition. This story updates a version published on June 26, 2017. Disclosure statement: Shensheng Wang does not work for, consult, own shares in or receive funding from any company or organization that would benefit from this article, and has disclosed no relevant affiliations beyond their academic appointment. In the Pixar animated film “Inside Out,” most of the plot plays out inside protagonist Riley’s head, where five emotions – Joy, Sadness, Fear, Disgust and Anger – direct her behavior. The film was released to glowing reviews. But director Pete Docter later admitted that he always regretted that one emotion didn’t make the cut: Schadenfreude. Schadenfreude, which literally means “harm joy” in German, is the peculiar pleasure people derive from others’ misfortune. You might feel it when the career of a high-profile celebrity craters, when a particularly noxious criminal is locked up or when a rival sporting team gets vanquished. Psychologists have long struggled with how to best understand, explain and study the emotion: It arises in such a wide range of situations that it can seem almost impossible to come up with some sort of unifying framework. Yet that’s exactly what my colleagues and I have attempted to do. One challenge continues to plague those who research schadenfreude: There’s no agreed-upon definition. Some think it’s best to study the emotion in the context of social comparison, so they’ll tend to focus on the way envy or resentment interacts with schadenfreude. Others view the emotion through the lens of justice and fairness, and whether the sufferer deserved his or her misfortune. Finally, the last group thinks that schadenfreude emerges out of intergroup dynamics – members of a group deriving joy out of the suffering of those outside of the group. In our view, the different definitions point to multiple sides of schadenfreude, each of which might have distinct developmental origins. Perhaps the writers of “Inside Out,” when deciding to jettison “Schadenfreude,” thought that it would prove too difficult for children to grasp. There’s evidence, however, that children begin to experience schadenfreude early in life. For example, at four years old, children found someone else’s misfortune – like tripping and falling into a muddy puddle – funnier if that person had previously done something to hurt other children, such as breaking their toys. Researchers have also found that two-year-old kids primed to be jealous of a peer experience glee when that peer suffers a mishap. By the age of seven, children feel more pleased after winning a game if a rival lost than when both won the game. Finally, in a 2013 study, researchers had nine-month-old infants observe puppets interacting with one another. Some puppets “enjoyed” the same types of food that the infants enjoyed, while others had a different set of tastes. When some puppets “harmed” the other puppets, the researchers discovered that the infants would rather see the puppets who didn’t share their tastes be hurt over the ones who did share their tastes. Together, these studies show that schadenfreude is a complex emotion that seems to be deeply ingrained in the human condition. Psychologists Scott Lilienfeld, Philippe Rochat and I wondered if there could be a way to unite the multiple facets of schadenfreude under the same umbrella. Eventually, we settled on seeing schadenfreude as a form of dehumanization – the act of depicting and viewing another person as less than human. When most people hear the term “dehumanization,” they probably go to the worst-case scenario: a complete denial of someone’s humanity, a phenomenon relegated to torture chambers, battlefields and racist propaganda. But this is a misconception. Psychologists have shown that people often view their own group in more human terms, and – in subtle ways – can deny the full humanity of those outside of their group. In our review, we hypothesized that the more empathy someone feels toward another person, the less likely they are to experience schadenfreude when that person suffers. So in order for someone to feel schadenfreude toward another person – whether it’s a rival, someone in an outgroup or someone who’s committed a crime – they’ll need to subtly dehumanize them. Only then does the sufferer’s misfortune become rewarding. This theory hasn’t been tested yet, so at the end of our review, we suggest ways schadenfreude’s early origins and individual differences can be placed under scientific scrutiny to study this novel hypothesis. Linking schadenfreude with dehumanization might sound dark, especially because schadenfreude is such a universal emotion. But dehumanization occurs more often than most would like to think – and we believe it’s behind the pang of pleasure you feel when you see someone fail.